The concept of wireless charging can be traced all the way back to Nikola Tesla. Here, Jeff examines the background and principles involved in charging devices today without wires, and takes a hands-on dive into the technology. Nikola Tesla is the recognized inventor of the brushless AC induction motor, radio, fluorescent lighting, the capacitor discharge ignition system for automobile engines and more. His AC power (with Westinghouse) beat out Thomas Edison’s DC power in the bid for the electrification of America. DC transmission is limited to miles due to its relatively low voltage and its transmission line loses. Thanks to the advent of the transformer, AC can be manipulated allowing higher voltages and higher efficiency power transmission. Today’s research in superconducting cable may be challenging these concepts—but that’s a story for another time. Tesla wanted to provide a method of broadcasting electrical energy without wires. The Wardenclyffe Tower Facility on Long Island Sound was to be used for broadcasting both wireless communications and the transmission of wireless power. Tesla even viewed his research on power transmission as more important than its use as a method for communications. Unfortunately, Nikola was never able to make his vision a reality. We think of Guglielmo Marconi as being the father of radio for his development of Marconi’s law and a radio telegraph system. He was able to obtain a patent for the radio using some of Tesla’s own ideas. It’s interesting to note that after Tesla’s death in 1946, the U.S. Supreme Court invalidated the Marconi patent because the fundamental radio circuit had been anticipated by Tesla. Again, not the direction of this article. It was likely that Nikola’s work in far-field power transmission had not been fruitful due to propagation losses (inverse square law). Even today’s work on beam-formed, far-field transmissions are marginally successful. Transformers are successful because they operate in the near field. The close proximity between the primary and secondary coil and a well-designed magnetic energy path result in low energy losses in transformers. Today’s wireless charging systems for our portable devices are based on transformer operation. However, the primary and secondary coils are not in physical contact yet still transfer energy Figure 1. 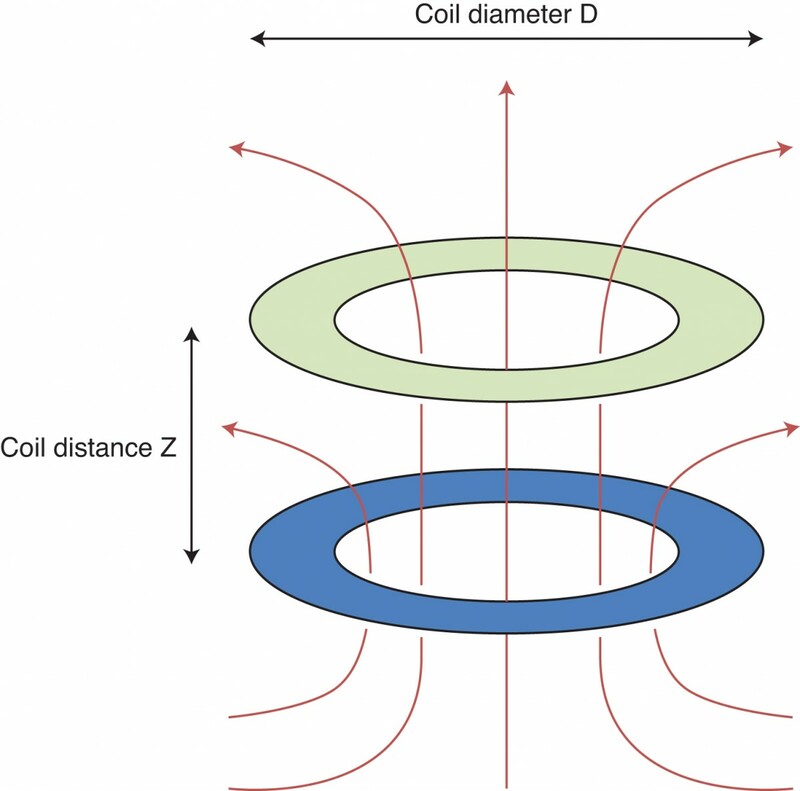 Efforts to maximize the magnetic field’s coupling exist, but this less-than-ideal coupling reduces the efficiency of the transfer—50% to 70% efficient. There are basically two methodologies today: inductive (tight) coupling (near field) and resonant inductive (loose) coupling (mid field). The resonant circuit allows an equivalent power to be transferred at a slightly greater distance. The device is considered near-field (closely coupled) when the distance between the coils is less than the coils diameter. The mid-field device’s distance exceeds the coils diameter and relies on resonance to improve its power transfer. Wireless efforts are in total flux with at least three organizations jockeying for position: The Wireless Power Consortium (WPC, induction), the Alliance for Wireless Power (A4WP, resonant) and Power Matters Alliance (PMA, induction). Interestingly, after WPC announced its plans to widen their specs to include resonant technologies, A4WP and PMA merged to become the AirFuel Alliance and now cover both technologies as well. Beyond induction type, the biggest differences between the technologies is in control communication. Control of the charging process requires communications between transmitters and receivers. Induction technology uses in-band modulation of the RF signal to send and receive communications. Resonant induction technology uses Bluetooth for out-of-band communications. This makes the transmitter/receiver pair simpler but adds the complexity of Bluetooth. Since many receiving devices already have Bluetooth, this may be moot. The WPC has coined the term Qi for their standard. If you search the web for wireless charging, this term pops up all over the place. This is not to say the AirFuel’s standard isn’t available—it seems to be a difference in promotional strategies. 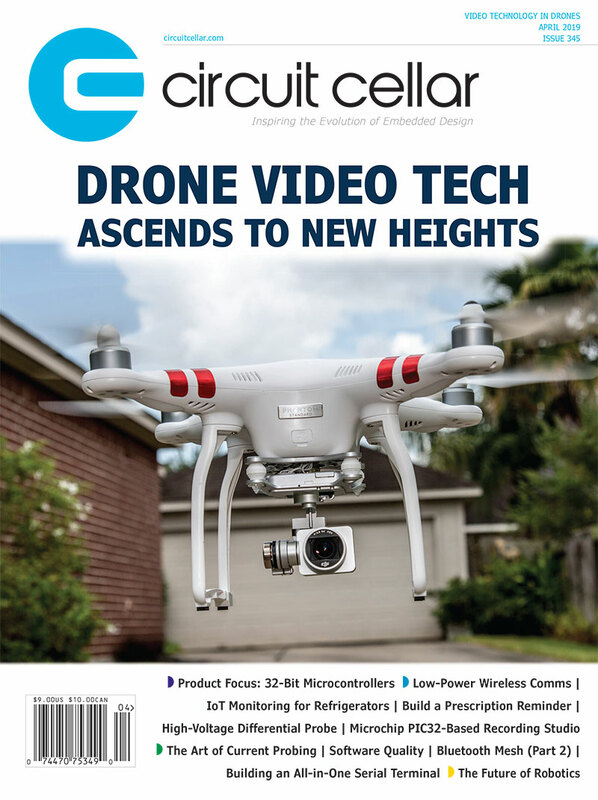 AirFuel has invested in getting their receivers into devices and their transmitters installed in public places. And while Qi receivers are also going into devices, their transmitters seem to be aimed at the individual. That means easy access to both Qi transmitters and receivers. You can get the V1.2.2 specifications for the Qi standard from the WPC website. The current version (1.2.3) is available only to members now but should be public shortly. The two documents I received were “Reference Designs” and “Interface Definitions” for Power Class 0 specifications. Power Class 0 aims to deliver up to 5 W of energy wirelessly via magnetic induction. This is accomplished by applying a fixed RF signal—generally in the 140 kHz range—into an inductive load (transformer primary). This is much like providing motor control using a half or full bridge, with the (transmitting) coil as the load instead of a motor. 500 ms and last about 70 ms (Photo 1). Once in range the receiver gets secondary current and can self-power. During the last 50 ms of a ping, a receiver has a chance to communicate by modulating its load at 2 kHz rate (Photo 2). There are presently 16 messages it can choose to send. 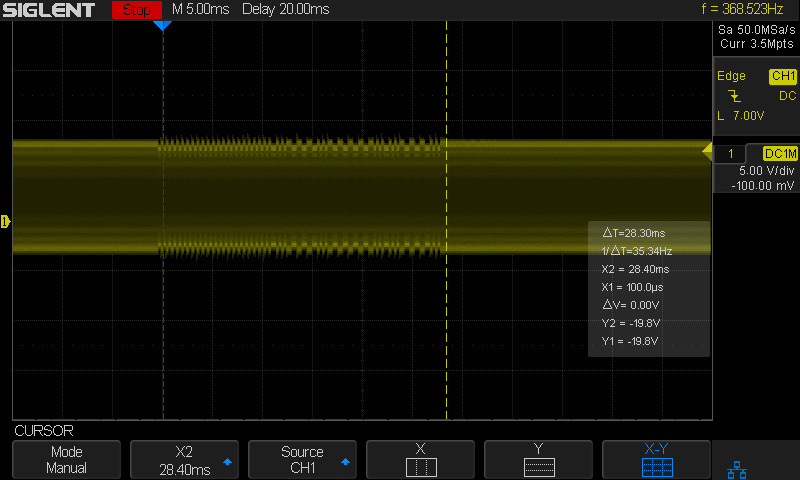 This oscilloscope screenshot shows the “ping” transmissions of a wireless transmitter with no receiver in range. Here we see a receiver sending a packet by modulating its load during the transmitter’s RF transmission. Each message has four parts: a preamble, header, message and checksum. The preamble consists of from 11 to 25 “1” wake-up bits. The header is a 1-byte command value. The message length is fixed for each command, presently 1 to 8 bytes. The checksum is a 1-byte sum of the header and message bytes. All bytes in the header, message and checksum have an 11-bit asynchronous format consisting of a start bit (0), data bits (for example Command, LSB first), odd parity bit (OP) and stop bit (1). Each bit is sent using bi-phase encoding. 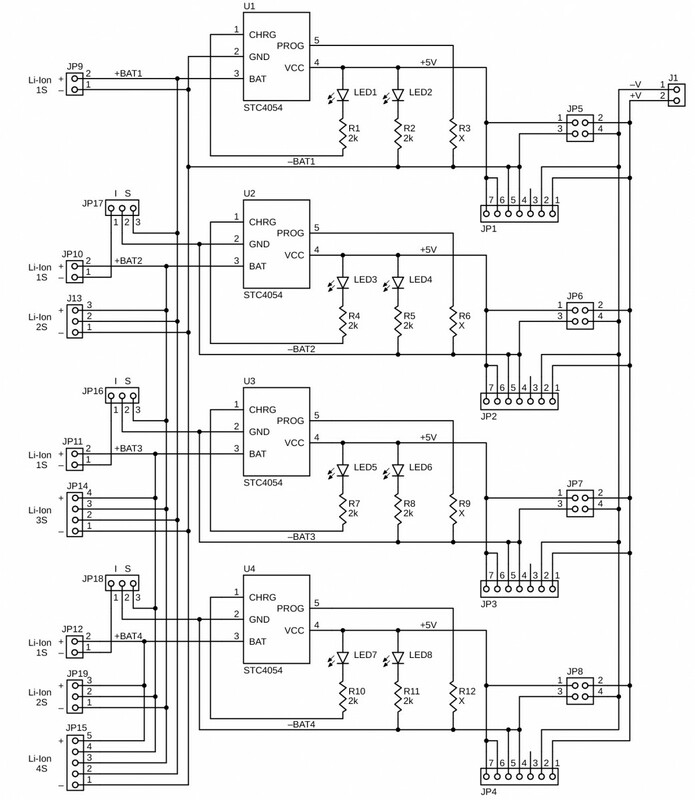 Each bit begins with a state change in sync with its 2 kHz clock. The value of a bit is “0” when its logic states does not change during a 2 kHz clock period. If the state does change within that period, then the bit is a “1”. The receiver has control over the transmitter. It initiates communication to send information and request power transfer. Back in Photo 2 you can see a Control Error Packet with a Header=0x03 and data=0x00. The signed value of the data indicates any difference between the requested and received current level. While the receiver is in charge (ha! ), the transmitter can acknowledge requests with 1 of 3 responses: ACK (accept), NAK (deny), or ND (invalid). Responses have no packet per se, but are merely a Frequency-shift keying (FSK) modulated pattern of 0s, 1s or alternating 0s and 1s. The receiver can request the depth of the FSK modulation from a list of choices between +/- 30 to 282 ns. The depth is defined as the difference in ns between the 1/Fop (operating frequency) and 1/Fmod (modulation frequency). The format is again bi-phase encoding in sync with the RF frequency. All bits begin with a change in modulation frequency. A “1” bit is indicated by a change in frequency after 256 cycles, while a ‘”0” bit has no change until the beginning of the next bit time. Responses are therefore easy for a receiver to demodulate. So, communication is AM back-scatter from the receiver and FM on the base RF from the transmitter. The present specification defines three packets that can be sent by a transmitter in addition to the ACK, NAK and ND. These are informational and are formatted like the receiver packets, less the preamble. From the transmitters point of view, it has 4 basic states: ping, ID, power transfer and selection. The transmitter is idle while in the ping state. Without some communication from a receiver, the transmitter will never do anything but ping. Once communication begins the receiver attempts to identify itself and become configured, at which point the transmitter can start power transfer. The transmitter will continue monitoring its feedback and change states when necessary. For instance, if communication is lost, it must cancel the power transfer state and begin to ping. The ability to detect foreign objects (FOD) is required for any system that can exceed 5W of power transfer. This parameter adds an additional 3 states to the basic 4 states: negotiation, calibration and renegotiation. 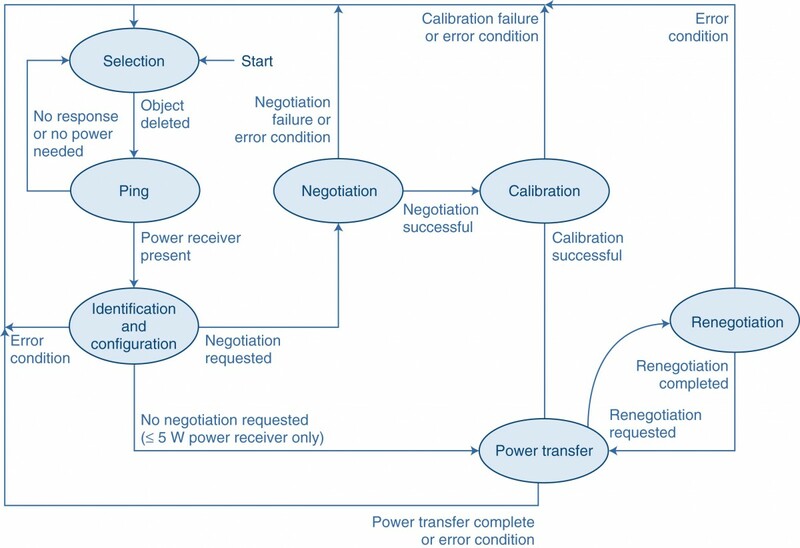 When using FOD the negotiation state is required to complete identification, configuration and calibration. Calibration allows the transmitter to fine tune its ability to FOD. During the power transfer state, the receiver may wish to adjust its configuration. As long as no requests violate operational parameters, the power transfer state can continue. Otherwise the selection state will redirect further action. You can see how this works in the state diagram in Figure 2. This is a general state diagram of the Qi standard for wireless chargers. Note two potential paths based whether or not foreign object detection is supported (required for greater than 5 W). From the receiver’s point of view, it could be in an unpowered (dead) state prior to entering the transmitter’s field. Once within range, the short ping from a transmitter is sufficient to charge up its capacitive supply and begin its application programming. Its first order of business is to look for a legal ping, so it can properly time its first request 40ms after the beginning of a ping. The first packet is a signal strength measurement, some indication of transmitted energy. This is sufficient for the transmitter to enter the identification and configuration state by extending its RF timing and look for additional packets from the receiver. The receiver must now identify itself—version, manufacturer and whether or not it accepts the FOD extensions. A configuration packet will transfer its requirements as well as the optional packets it should expect. 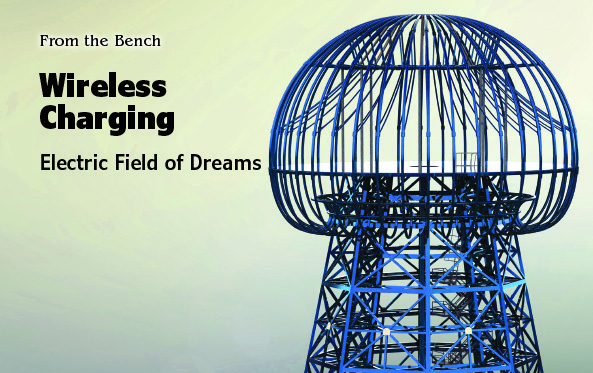 The transmitter digests all this data and will determined, based on the receiver’s ability to accept FOD extensions, whether it will proceed directly to the power transfer state or enter the negotiation state. Packets must have a minimum of 7 ms silent period between each. The values sent in the configuration packet denote an official power contract between the transmitter and receiver. When the receiver doesn’t accept FOD extensions, it is this contract that the transmitter will abide by once it enters the power transfer state. If FOD extensions are enabled, it enters the negotiation state in an attempt to change the contract and provide higher power. The transmitter’s response lets the receiver know when a request to change a parameter is acceptable. This way both receiver and transmitter agree on the power contract it will use when negotiations are closed. Once negotiations have ended, the calibration state is entered. The calibration consists of multiple packets containing received power values measured by the receiver while it enables and disables its load (maximum and minimum power requirements). This provides the transmitter with some real use values so it can better determine FOD. During the power transfer (PT) state, the receiver must send a control error packet every 250 ms that the transmitter uses to determine its operating (PID) parameters. Meanwhile, received power packets are sent every 1,500 ms. Without this feedback, the transmitter will drop out of the PT state. Other packets can affect the PT state as well—most notably an end power packet. This may be due to a full charge or other safety issue and the transmitter drops out of the PT state. At this point a receiver can cease communication and while the transmitter will begin pinging, the receiver can rest indefinitely. I’ve found that the Qi receivers with micro USB connectors make it easy to add wireless charging to your phone or tablet. One of these fits inside my Motorola phone with only the smallest bump of the connector on the outside. My Amazon Fire is not so lucky. It had to stay on the outside (Photo 3). Shown on the left, the Amazon Fire required me to add the Qi receiver to the outside. It’s covered with a very large band-aid. 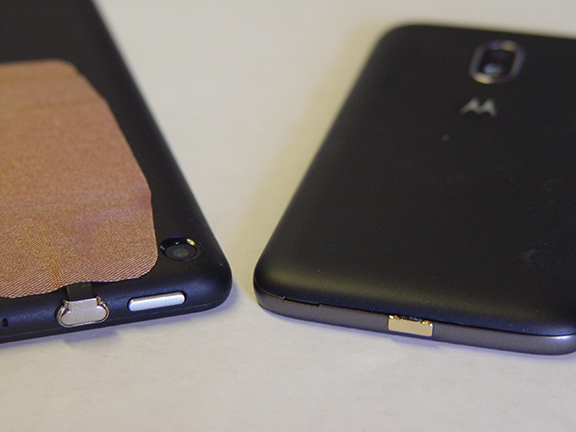 On the right, my Motorola phone had room inside. The only clue is the receiver’s minimally obtrusive micro USB connector. Adafruit has a module available that has no connector and is not enclosed in a skin (Photo 4). You can see in that photo that a receiver requires very few external components. This one uses a Texas Instruments bq51013B, which is less than $4. One advantage to choosing this device is the non-BGA version which is appealing to the DIYer that wants to hand solder the device onto a PCB. You can see how few components are required on the Adafruit Qi wireless receiver shown here on a wireless transmitter. The voltmeter shows a voltage output of 4.98 V.
I suggest that you use high strand, flexible wires when making connections to this because a stiff wire can cause undue stress on flexible circuitry. I want to use this wireless charge receiver to keep some of my robots charged. To do this, the robot has to ride over the top of a transmitter. The receiver would then recharge the on-board battery or batteries. I’ve chosen to use Li-ion batteries because they have a high power-to-weight ratio. They also have a relatively flat discharge curve. Unfortunately, a single cell 3.7-V Li-ion battery is not sufficient to power most motors. Therefore, multiple cells must be used. When multiple cells are in series the charging becomes an issue because the cells should be charged using a balanced charger to prevent charge imbalance. Charging cells in series as a group cannot prevent the over/under charging of individual cells. This means one of two approaches: Use a single cell and use a boost power converter to obtain your necessary voltage, or use a more complicated multi-cell, balanced charger with a boost converter between the wireless receiver and the charger’s input. Upon contemplating the pros and cons of each method, I’ve decided to use a modular approach by treating each battery as a separate entity. The simplest charging IC I could find was STMicroelectronics’ STC4054. This is a TSOT23-5L (5-pin) device that requires only one external component to set the charging rate. This is important because some chargers will allow very high currents and I will be sharing the current for all chargers via one wireless receiver. While these can handle 1 A, if I want to say, charge four Li-ion batteries in series I need to limit each charging circuit to 250 mA (250 X 4 = 1,000) or I run the risk of the wireless receiver becoming overloaded and everything will shut down. A minimum VCC of 4.25 V is sufficient to sustain a complete charge cycle. Here is a breakdown of the whole charge cycle: If the battery voltage is below 2.9 V it will be trickle charged at 1/10 of IBAT. Once it reaches 2.9 V it enters the constant current mode charging at IBAT. Once it reaches 4.2 V it switches to constant voltage mode to prevent over charging. The cycle ends when the current drops to less than 1/10 of IBAT. Should the battery voltage fall below 4.05 V, a charging cycle will begin to maintain the battery capacity to a value higher than 80%. The STC4054 is thermally protected by reducing the charging current should the temperature approach 120°C. The package leads are the main heat conductors from the die, so sufficient copper areas on the PCB will help with heat radiation. The device will max at 800 mA, but is spec’d to handle 500 mA at 50°C. You can expect stability without additional compensation unless you have long leads to the battery. A 1 µF to 4.7 µF capacitor can be added to the BAT connection if necessary. The CHRG pin is an open-collector output which can be monitored to indicate when the IC is in the charging state. It will pull down an LED if you wish a visual status indicator. This IC will cost you about $1.50. With no voltage applied to the IC, it will go into a power down mode with a drain of only 17 µA on the battery. Now this circuit takes care of charging a single battery, and we might have up to four in series. It’s the series part that is the problem because only the first can have a reference to ground. Since the wireless receiver is designed to produce a 5 V output, this is easily connected to the first charging circuit. We could try and get fancy with a boost converter to get a 20 V output to feed the four chargers with their inputs in series, but this has all kinds of bad karma associated with it. 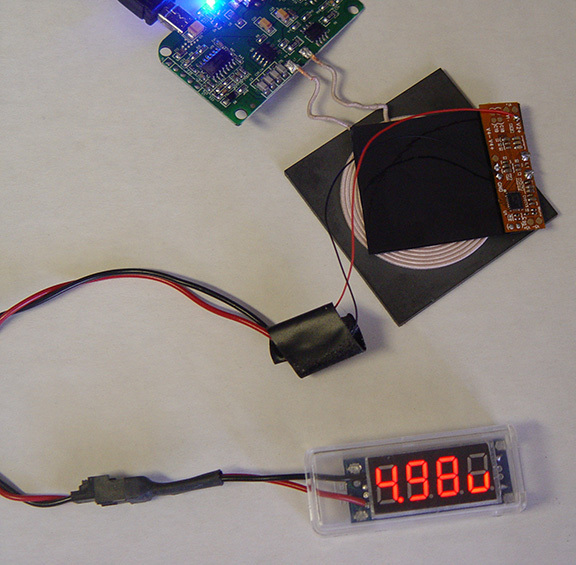 Fortunately, there is a rather inexpensive solution: Use isolated DC-DC converter modules. All converter inputs are in parallel on the wireless chargers output. Each of the converters’ outputs can be tied to a separate charging circuit. Since each of the converters’ outputs are isolated from its inputs, there is no reference to ground—the minus output of the wireless receiver). That means they can then be used to charge batteries which are connected in series. The circuit given in Figure 3 shows four changing circuits—each (potentially) using its own isolated 5 VDC to 5 VDC converter. These are available in 1 W to 3 W SIP-style packages and cost from $3 to $10 each. Modules with high current (greater than 3W) are available, but the package style changes to DIP. Their inputs are in parallel with a connector meant to go to the wireless charging receiver. There are a lot of jumpers used to select how the outputs of each charging circuit are to be connected to output connectors. Each charger can charge one Li-ion battery using a standard two-pin 1S1P (one series cell, one parallel cell) connector. Or you can jumper them in series, which uses the standard connectors for 2S1P, 3S1P and 4S1P (series cells). This schematic shows four Li-ion cell charging circuits using the STC4054. The input to each IC can come from an optional isolated source when using a DC-DC converter from RECOM. If each of the charging circuits are isolated, they can be applied to separate Li-ion cells in series. You’ll note that multi cell Li-ion battery packs usually come with two connectors—one for use and one for charging. The charging connector contains a wire to each battery junction to allow cell-balanced charging (Photo 5). 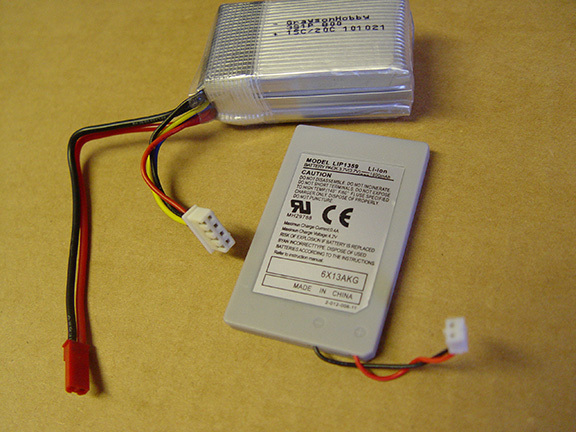 Battery packs that feature balanced charging usually contain the JST HX connector for charging. The power contacts are another story. They may be JST HSNG style, Dean’s connector or other specialty types. There seems to be some standardization on balanced Li-ion cell chargers. They require a common plus 1 wire for each cell so each cell can be monitored and charged independently. This means any battery pack with more than one cell requires separate connectors for charging and discharging. You’ll find plenty of the small robot bases using AA batteries with a UNO or some other micro platform as its controller. There is nothing wrong with these inexpensive platforms for educational purposes. With a fresh set of batteries, you will usually have predictable behavior. In rather short order however, things will begin to go loony. The motor load will begin to affect the controller as the battery voltage dips. Even at 6 V, with a low drop out regulator, the controller operation and any sensors will quickly become unpredictable. This can be truly a frustrating time for the newbie, as one searches their code for a logic error that might produce the inappropriate action observed, when actually there may be nothing wrong! You can save a lot of heartache if you just add an extra battery (or two) to raise the voltage to 7.5 V or even better 9 V. I’ve seen kids quickly lose interest or give up entirely simply because they don’t understand what’s happening. I’ve found a better solution is to replace the AAs with a couple of Li-ion 18650 type 3.7 V cells. 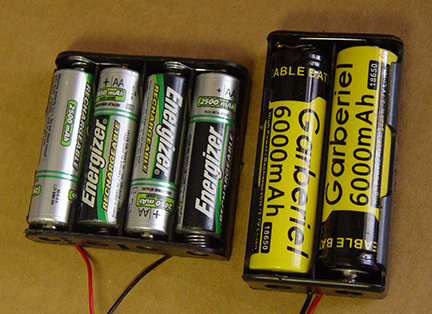 The 18650 looks like an over-sized AA battery and has battery holders that are similar (Photo 6). You can expect about 2,000 mA-hours from AA cells. The 18650 Li-ion cells pack about three times the energy and they can be popped out and recharged in a few hours. Li-ion flat packs can also be used here, but they are not as “universal” as the 18650 single cells. Replacing four AA cells with two 18650 Li-ion cells can save a lot of head scratching when unexpected behavior is due to battery droop. 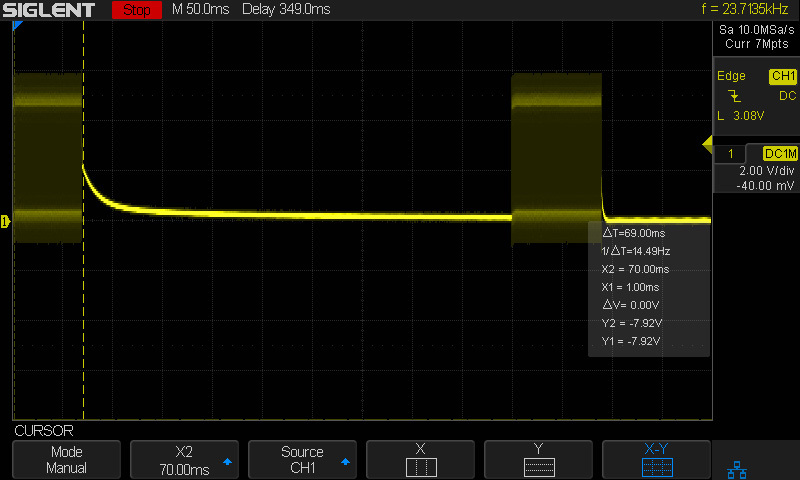 The AA cells (4 x 1.5 V) does not leave much headroom when a 5 V regulator is used. Not only is the discharge curve relatively flat for Li-ion cells (2 x 3.7 V) preventing drops in regulation, but the 18650 packs 3 times the energy. It is a good idea to remove batteries from any equipment that will not be used for extended periods of time. Many devices today—like the ones with auto off functions—have parasitic circuits that continue to draw minuscule currents even when “off”. These will continue to draw down your batteries until they are unusable. Even though Li-ion cells have a protective circuit that prevents them from being discharged below a safe level—approximately 2.75 V/cell—this internal circuitry is parasitic and acts as a tiny load. While self-discharge is only a few percent per month, once the cell voltage drops below a critical voltage this circuitry may not allow it to be recharged. So always store a rechargeable in a “charged” state. Wireless charging is only in its infancy. Today’s phone chargers are typically less than 5 W. But there is work being done on higher rated equipment. It is proper that these low power devices have such safeguards built-in to prevent unwanted catastrophes. We know from the not too distant past that, along with higher power density materials, comes the potential for calamity unless the proper safeguards are in place. Public education can limit the misuse and/or abuse of lithium technology, just as it has for the safe handling and use of gasoline. In order for the electric vehicle to become useful, we will need to replenish its range-defining battery charge in fairly short order. This requires extreme infrastructure changes. You can tell by the size of the connectors and cable required for this process that this is high power. The holy grail is for this to happen wirelessly and automatically. From a simple pad embedded in ground where you park your vehicle, to a highway infrastructure that transfers power to your vehicle while you drive. Wireless power transfer is here to stay. Nikola Tesla must be at peace knowing that his work is beginning to bear fruit. This entry was posted in Archive Article, CC Blog and tagged Batteries, charging, Qi receiver, wireless by Circuit Cellar Staff.